Fall fashion trends are fun to explore. From fabulous folklore, to rich red, to denim and more denim, this season has got something for everyone. We have officially turned a corner—it’s time to retire the onesies and beachwear and get back into real clothing again. Fall means back to business, back to school and back to routine. Trends exist to guide us, but they also give us a license to have fun. The Canadian Tuxedo went on a world tour on runways this year. This fall, it’s not just about denim-on-denim but denim shoes, bags and denim thigh high boots. 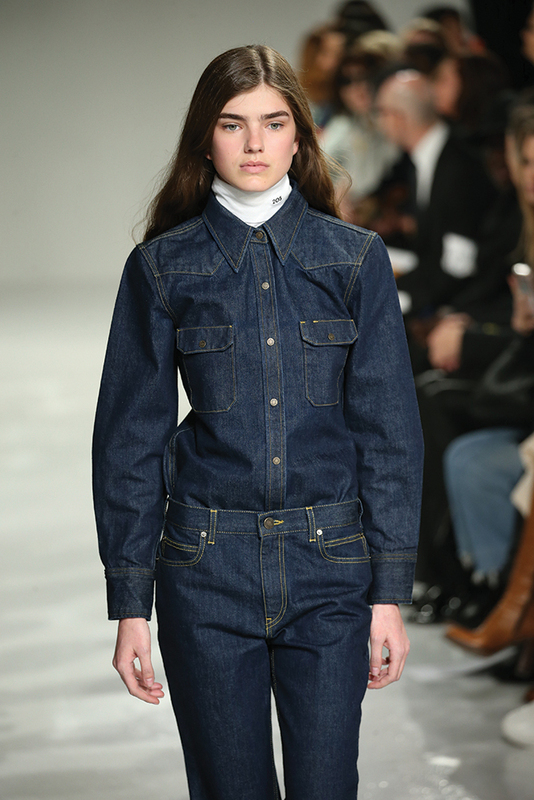 Dior did a fabulous rendition of our good old and trusty Canadian tuxedo. Return to the originals and check out Calvin Klein for inspiration. Fiery red ruled the runways of Paris and New York with the best samples being at Armani and Givenchy. Only want one item? Go for a handbag to make a statement or the red leather Fendi thigh highs. It’s also perfectly timed for Canada’s 150th anniversary—we should all wear a little more red this season. Prada FW 2017. Photo Credit: Prada. Dare to go bare with sheer and transparent fabrics OR rock vintage fur and hide in ostrich feathers. Fendi’s July show of their Autumn 2017 collection has bare done right and Prada took fur somewhere we haven’t seen with partial fur coats and jackets. These wardrobe statements are what FW17 is all about. Metallic silver. Remember Cher’s metallic midi backpack in Clueless? IT’S BACK! Silver hit the runway hard with Michael Kors, Dolce & Gabbana, and Isabel Marant. If you won’t dare to be bold and do a full silver outfit, pair a metallic top with simple bottoms and boots for an effortless trendy look. Stephan Caras FW 2017. Photo Credit: Stephan Caras. It’s not just a fairytale: Bohemian, Russian dolls and mixed multiculturalism were spotted on the runways at Alexander McQueen and Gucci. Dolled up was done right at Stephan Caras with this floral brocade ruffle frock mini. So cute, this exact look has already been sported by country music star RaeLynn who charmed us in Caras at the CMT awards this past June. This fall, hold onto your favourites and include what you like from what’s new. Fishnets, wide belts, plaid, glitter-covered boots and clear raincoats are trends to add to your closet now. Velvet Avenue. Photo Credit: Velvet Ave. The powersuit is back with a vengeance. Menswear inspired with broad shoulders, plaids and checks, dominated the runways. Look to Alexander Wang, Balenciaga and Michael Kors for your perfect suit, and pair it with the resurfaced and updated polka dot blouse. Retro hats should stay in the past. Couch florals are meant for furniture, not your body. Florals are fresh and fun but belong in the past summer months. The midi skirt can be feminine, but this silhouette is not flattering on most. If you want mid length, opt for culottes instead. Orange is the new black for men this season; it’s the “it” colour to coordinate with his leading lady in red, or perhaps outshine her. The classics are back: neck ties, double-breasted suits, and broad shoulders were strong on the runways. Even the slim suitors like Armani and Hugo Boss have taken on this trend. Need proper assistance? Head to Harry Rosen, Holt Renfrew, or Tiger of Sweden to nail this look. Athleisure (or athletic leisure) is not just for the kids. Think retro snow bunny with technicolour sequined tracksuits for the ladies and rainbow sweats for the men. Stay roomy in quilted fabrics, and large loose knits with graphics knotted in, or channel old-school Adidas with bold colour leisure suits. For trendsetters: find your sweat mark at Off-White in Yorkville or online. HM Sweater; HM Shoes; Zara Pants. Photo Credit: AOC Photography. With labels like Dolce & Gabbana designing children’s clothing lines, kid-focused fashion is on the rise. For the girls, white lace, denim fringe and bohemian patchwork rule. For the boys, chill out like Mr. West in dropped crotch sweats and distressed tracksuits. Tomboys are included too in #Famleezys club. Shop directly from Mr. and Mrs. West’s new line for little ones at thekidsupply.com.